Hotel Baronka Bratislava, Baronka Hotel is located in the eastern part of Bratislava - Raca in picturesque surroundings at the foot of the Little Carpathians. This area is one of the nicest and safest areas of Bratislava and has been known for its centuries of wine tradition. Baronka Hotel a four-star hotel offers its guests one of the best and most preferred affordable accommodation in Bratislava. Besides accommodation, dining, congress and relaxing services, offering its guests a wide range of additional services. 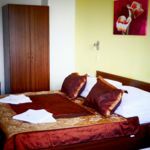 The rating of Hotel Barónka Bratislava is 9.3 from the maximum 10, 16 based on actual and valid guest ratings and reviews.